David Cox talks up his "second great love"
Who's up for some Contra? Back in June last year, Castlevania: Lords of Shadow - Mirror of Fate developer MercurySteam revealed it would love to work on a Contra game for Konami, should the opportunity arise. I'm a big fan of Contra. After Castlevania, Contra is my second great love. The thing about Contra is that since Contra III was not a mainstream game more - but the rest are absolute core gamer title. I think it cries out for a reboot! If we are to have the opportunity or not, I can not say. But Contra would be cool. 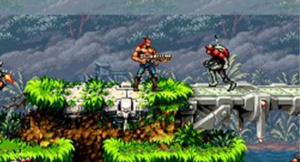 Contra 4 was released on the DS and was developed by WayForward Technologies. Could Konami be lining up a new iteration with MercurySteam and David Cox at the helm? Would you like to see another Contra game? If so, which console would you like to see it on? Let us know in the comments below. There was a Contra 3DS announced at E3 2010 but there's been nothing on it since then. As much fun as I had with Contra 4 and Rebirth (not much), I honestly do not want to see another one for a very long time. Announced back in 2011. Sounds like it turned into vapourware. I never played Contra... but I never liked "metroidvania" games, too, while I LOVE Mirror of Fate, so if they'll do that, I'll try that! I'm fine with the virtual console titles. "The thing about Contra is that since Contra III was not a mainstream game more - but the rest are absolute core gamer title." Might be cool! I like wayforward Contra! How about lord of shadows series on Wiiu! We got us some Batman some ninja gaiden, need some castlevania yo! Do it dammit!!!! Day one purchase for sure, loved all the contra games except those sony abominations for ps1 and ps2. Lol, the promise of 3DS Contra was what sold me on the 3DS, and yet apparently no one is actually working on it. For the sweet love of Lance Bean please do NOT make a Contra game, MercurySteam! Especially after the trainwreck that was Mirror of Fate! Let Wayforward or M2 make the next Contra! They'll do a bang-up job I'm sure! Just give WayForward a Contra 5. Contra 4 was my favorite Contra game since the first one. Contra 4 was amazing, was the deal with this guy! If, by reboot, he means a loving homage (which was what the INCREDIBLE Contra 4 essentially was), then, by all means, go for it. Mirror Of Fate is not that bad... 3d graphics on a 2d plane is so awesome... played the demo and loved it... just glad it wasnt a God of War clone... Im all in for them making a contra... heck why not?? Oh my God, please not another reboot! Mercury Steam isn't going to stop until it's rebooted every Konami franchise I grew up loving, and transform it into something unrecognizable from what it used to be. If Castlevania was his greatest love and he has done that to the game, imagine what terrible things he would do to Contra. Please Konami, don't let him get near to none of your games anymore. Get back from Alien Wars stopped and we're fine. WayForward can handle it pretty fine as they did on Contra 4. MercurySteam should no longer be allowed to touch another classic and try to reboot it once more. Oh please no. Somebody has to finally stop this guy. I want my Contra, dammit!!!!! Not really interested. I prefer to see them make an all new ip. I take it then that those two are the only Castlevania games you've played? @Nlife btw, David Cox is not a member of Mercury Steam but of Konami. I know Contra is something of a niche game nowadays, but honestly, I'd rather it stay that way than see a MercurySteam reboot of it. After what they did to Castlevania, I shudder to think of what they could do to Contra, especially in today's market. Please, Mercury-Steam, stay away from any franchise. Including Castlevania. Make a new IP or something...maybe you won't be criticized then! @SqueakyTheBone "ALPHA RED, GO GO GO!! BOMB AWAY THAT BUILDING WE GOTTA KEEP THOSE ALIENS AWAY FROM HUMANITY!!" "So the aliens are gone. What now?" "ALPHA RED, GO GO GO!! BOMB AWAY THAT BUILDING WE GOTTA KEEP THOSE HUMANS AWAY FROM OUR BASE!!" alot of overreactions to the MercurySteam castlevania going on here, people acting like they made superman64 for the 3ds or something. To me its a refreshing take on retro castlevania, especially after 7 games of metriod-vania. I'm not down on MercurySteam, but nothing they have done so far is particularly appealing to me and I'm not keen on them handling the next Contra game based on their current work. Also, what is this talk of a reboot? Contra isn't a game world that needs stories to be retold or genres bent... it's a gaming style that involves manic action, big guns with awesome power-ups, and aliens in need of defeating. I don't want another Contra Force (although seeing that game on Virtual Console would be kind of neat) re-imagining of how the series should play. Not really related, but Contra 4 on DS was nearly perfect. MercurySteam seems to have little respect for these franchises, always talking about rebooting them instead of, I dunno, actually making a real SEQUEL, for God's sake! Unrestricted, infinite creative freedom and removing themselves from an already established canon seem to be MercurySteam's two most important principles. I shudder to think how it would sound like if Dave Cox was a big fan of Zelda or Pokémon: "There's so much we could do with Zelda or Pokémon! I can't wait to get my hands on these series, scrapping the established timeline and all the existing Pokémon, and making a game that is awesome because it spits on the legacy of the series! Those previous entries were so bland! Here comes our innovative GOW clone that also disregards all the classic themes because they don't fit with our vision of what is REAL music"
Maybe I went a bit overboard with the last bit, but my point still stands: MercurySteam has a rebooting fetish. F***ing love this game series!!!!! Please keep MercurySteam away from Contra. They already ruined Castlevania. While we're at it, why not let WayForward make a new Castlevania game? They did great with Contra 4. I've been waiting since "SHATTER SOLIDER" for another Contra game.damn!!!!!! how long must we wait for another one to be released????? if konami give go head i hope it will be on ps3 as a PHYSICAL disc. not some dang DLC off PSN like Hard Corp. good to own your games physically. come on KONAMI make this happen!! like to play another contra before i die.